The off-season is a golden time to make focused changes to increase performance next season. Losing weight is the most likely place to reap gains for most mountain bikers. Climbing hills at a bodyweight of 150 pounds is a lot easier than at 175 pounds. At a lighter body weight you won’t have to work as hard, will be faster racing, and have more fun on group rides. Cutting weight is not easy. It takes dietary modifications, portion control, and a calorie deficit. These factors can negatively impact immediate training and performance. Lose the weight now, in the off-season, so as not to interfere with training later when it counts. Get down to race-weight before race-season so you can keep a neutral calorie balance for intense in-season training and optimal racing. 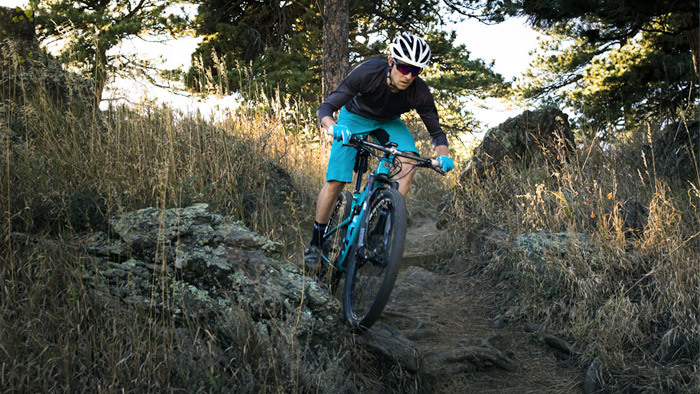 For mountain bikers in particular, there are more benefits to racing light and lean than simply less gravity on the climbs. A leaner, lighter physique and increased power to weight ratio improves other areas of mountain bike performance. Accelerations are a large part of mountain biking. Race starts, sprint finishes, increasing speed into short steep climbs and out of corners, are all common places accelerations are needed. With less mass to move, you can accelerate faster with the same power. On a course with 50 corners this adds up. For short steep climbs, a fast acceleration can make the difference between cleaning the climb or walking. Next time you are out on your mountain bike, count how many times you make the sit to stand transition. Probably more than you realized! Mountain bikers are up and down a lot – sitting into a corner, standing in the corner and accelerating out of the corner, and then sitting down into the next corner. Up-down-up-down is common. Carrying extra mass on your torso is a penalty each time you stand. Racing lighter will make these transitions faster and use less energy. Riding out of the saddle happens a lot more on the mountain bike than the road. Most descending is done standing, accelerations, technical sections, some climbing and sprint finishes are out of the saddle. With less body weight, more energy can be devoted to forward momentum than holding your body up. In technical sections, smaller lighter riders, are more agile and move over the bike faster. Watch some race footage of lean elite World Cup mountain bike racers and you’ll see how easily they dance on their bikes. Peaking for a race while lean always adds to the feeling of readiness and increases excitement about performance. This feeds on itself as high motivation promotes good training habits and the discipline to keep it all together until race day. Nailing race weight puts you in the flow of feeling race-ready, and increases confidence. Looking the part and acting the part, leads to being the part. Overheating during racing makes your brain tell your body to slow down and cool-it. Fat is a good insulator and common sense will tell you a leaner athlete will shed heat during intense exercise and on hot days more easily that an athlete with more body fat. There are further benefits than simply having less insulation that promote higher performance in leaner athletes on hot days. Muscle is denser than fat, thus a leaner athlete is smaller with a higher surface area to volume ratio than a fatter athlete, allowing them to dissipate heat more quickly. Dehydration lowers performance. Fat contains 10 percent water, muscle contains 78 percent water and blood contains 75 percent water. A leaner athlete carries more water on board at the start of a race to draw from for sweating. A leaner athlete will also have more stored muscle glycogen. Glycogen releases water when metabolized which also contributes to hydration. Leaner athletes can sweat more before dehydration impacts performance. Power to weight ratio is key for performance. For an athlete who is fit and has been training for a few seasons, losing body weight is often easier than building power to increase power to weight ratio. Also, cutting weight on your belly is a lot cheaper than cutting weight on your bike. This benefit is significant for the long distance racers; 24-hour solo and bikepacking guys. Less weight on the saddle means fewer saddle sores, and, to be blunt, less flab and skinnier limbs results in less chafing. This many not affect performance per-se, but will significantly affect enjoyment on a long ride. Sweat, dirt and raw skin are not an enjoyable combination and can distract from the overall race experience. Lighter people can run lower tire pressure for better traction and faster cornering without the fear of flatting. Losing weight is good for your health. It can lower blood pressure and protect you from diabetes and cancer. A healthier body is good for training and performance. There are diminishing gains as you get closer to your ideal race weight. Mountain Bike World Cup elite male racers maintain in the 6 – 13% body fat range. Female World Cup Elite racers in the 14 – 20% range. Dropping weight below these ranges is the threshold where health and performance benefits are outweighed by negatives of under-nutrition. Fire up a nutrition tracking app like MyFitnessPal and start a training program like our LW Coaching Weight Loss and Mountain Bike Base training plan to achieve your weight loss goal. Start next season lean, light and fast with all these performance benefits.